This car seemed to be saying, “Look at my tone-on-tone color scheme and matching tan house!” I walked toward it to get a closer look when I noticed a group of men playing cards behind the fake-grass covered fence. A young guy jumped up as I eyed the car. He didn’t look too happy. I was explaining to him that I was a photographer and like to take pictures of cars on the street, when an older gentlemen stood up from the card table and walked over. I could tell right away that he was the boss, and I told him I liked the car. 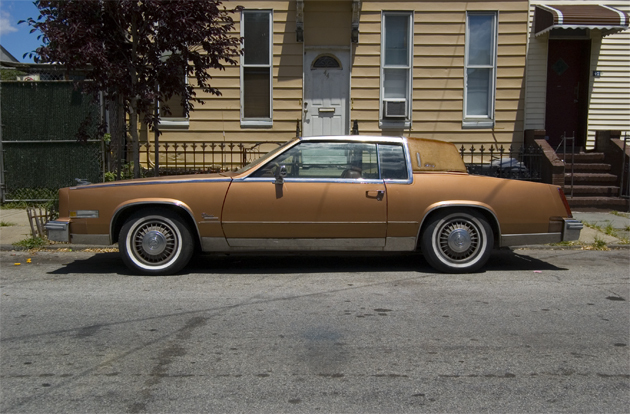 “It’s mine and I have another in the back,” he said, and led me to the gate where he kept a sleek black 60′s era Cadillac hidden under a tarp. “You should shoot this one.” Upon hearing that I immediately had a flashback to the movie Goodfellas where the Robert De Niro character tries to get his friend’s wife to enter a building all alone. Did he really want to shoot me? I was relieved when he gave me permission to shoot the Eldorado. I thanked him and vowed to bring him a print next time I was in the area.